This week the QmPR Blog is officially one year old. HAPPY BIRTHDAY, I wrote the first Blog post at the beginning of July and posted it while my website was still in development. I thought it was a good idea to have a number of blog postings completed before I launched my new website. This thought was confirmed by reading Denise Wakeman’s post ‘14 Attention-Grabbing Tactics for Launching a New Business Blog’. She suggests publishing 7 to 10 posts so I got writing blog content while I was creating the more general website copy. After a year of blog-ing this is officially my 46th blog, nearly a blog a week. In January I took up the #PostAWeek2011 challenge and have written a blog every week in 2011. So next year when my blog is two years on I will have 52 more blogs. 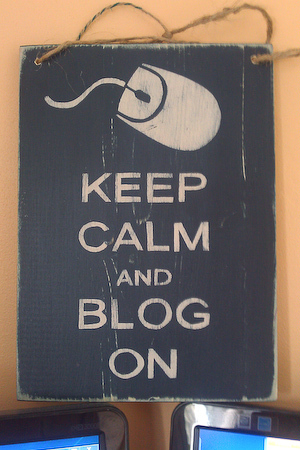 There is no trick to getting your blog going I am just really disciplined and ‘Keep Calm and BLOG On’. This entry was posted in Web content, Web copywriting and tagged Blog, postaweek2011. Bookmark the permalink.